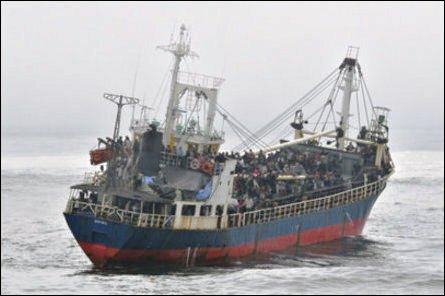 443 adults and 49 children are among the refugees who have travelled for 3 months in the cargo ship MV Sun Sea. 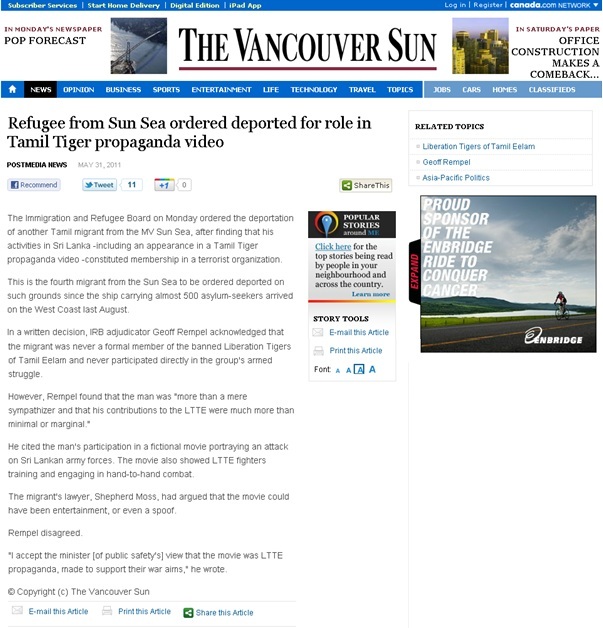 While various media outlets in Britain are enthusiastically attacking Sri Lanka, evidence is emerging in Canada which suggests that some of the monstrosities attributed to Sri Lankan soldiers may well have been perpetrated by the Tigers. I have cited previously a report of a trial in which a man admitted that he had been involved in the cold blooded killing of wounded Sri Lankan soldiers. Kevin Hatch, the representative for the Canada Border Services Agency seeking the man’s deportation, told the board that in an earlier interview, the man said that he had sent others around him to go — though there was a question of whether that statement had been accurately interpreted. Asked to clarify, the man testified Tuesday that he just mentioned to others around him that there had been a call for people with AK-47s to come forward. Rather splendidly, his lawyer, a man called Shepherd Moss, ‘had argued that the movie could have been entertainment, or even a spoof.’ The adjudicator however decided that ‘the movie was LTTE propaganda, made to support their war aims’. Mr Moss it seems is rather like those Channel 4 worthies who decided that Ms Isaipriya was a journalist whose work for the LTTE did not qualify her to be considered a terrorist. Even though she was dressed in military fatigues for the photograph in the identity card issued to her by the LTTE, she is seen by Channel 4 as a civilian who was not involved in combat operations due to her health condition. Presumably for Channel 4 Goebbels too was simply a civilian who should not have been tried at Nuremberg – indeed, given the tactics they use, based on the belief that, the larger the lie, the more credible it is, they would have awarded Goebbels a medal and made him Honorary Chairman of their company, as its chief inspiration. 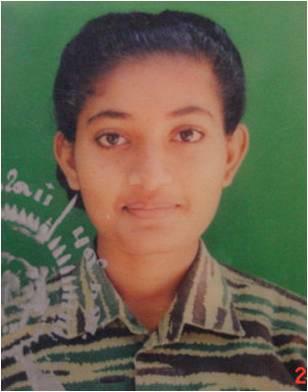 Channel 4 did seem to recognize that Issipriya glorified Black Tigers who carried out suicide missions, but her role in thus pushing youngsters into that disgusting task must seem to them not a war crime, but rather a reason for an Emmy, or whatever it is the British media rejoices in. In this regard I should note that the Norwegian Embassy, when they were told that the website of the LTTE Peace Secretariat was glorifying suicide cadres, told them that this item should be removed. 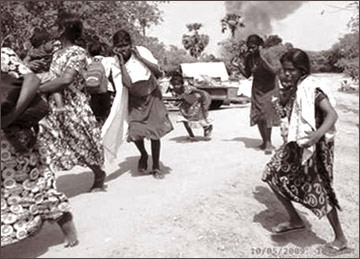 Sadly, UNDP, which had also contributed to the LTTE Peace Secretariat website, did not have a similar sense of responsibility and, though they agreed that what the LTTE was doing was wrong, they did not think it incumbent upon them to protest at this abuse of their generosity for what they had assumed was the promotion of peace. 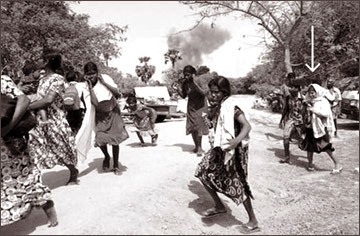 Given that Mr Thamil Chelvam, the Head of what was supposed to be the LTTE’s political wing, went around in military fatigues – and indeed had a child soldier in such fatigues at his funeral – it must have been clear to anyone actually concerned with abuse of the Tamils of the Wanni that the LTTE made no distinction between civilians and cadres. The more senior of its functionaries fulfilling civil roles, such as Thamil Chelvam and Issipriya were naturally dressed in military uniform and would have held appropriate ranks in the forces. But, like the fast thinking Mr Moss, perhaps Channel 4 would argue that this was simply for entertainment, just a spoof, to take in the children of the Wanni and make them think there was no alternative to military life, when really they would have been allowed to continue in school if they had only asked nicely when they were being dragged away. The LTTE ordered (or requested) that captured Sri Lankan soldiers should be executed. The instrument of choice was the AK-47, and even those who did not agree with the decision simply ‘mentioned to others…that there had been a call for people withAK-47s to come forward’. Is it not quite likely that experienced makers of propaganda films, who delighted also in spoofs (and we have the picture of a giggling girl with a camera filming other girls supposedly running from a scene of battle), might have filmed one of their executions to suggest that it was Sri Lankan soldiers doing the executing, and that the victims were terrorists rather than the wounded soldiers who were so ruthlessly shot with AK-47s?